We stayed in three hotels during our trip. I found our Roman hotel by googling. I had three search criteria: under €150, centrally located (although I really didn’t know enough about the geography of the city center to be very intelligent about that), and accessible. I emailed about two dozen hotels that seemed to vaguely fit my criteria. In my email, I said that I was a manual wheelchair user, gave the dimensions of my chair in centimeters, and asked about the hotel entrance, the elevator, the dining room, the room entrance and the room bathroom. Some hotels were already booked. Some cost €200 or more. Some responded that they were not accessible. I wound up with two candidates: Hotel Grifo and Hotel Lancelot. We chose the Grifo as they were slightly cheaper. 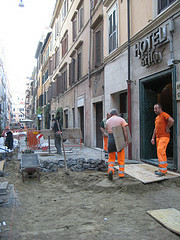 Hotel Grifo is on a small street in the Monti neighborhood (Rione Monti). There are pizzerias and Indian restaurants all around. It’s between two large streets full of shops: Via Cavour and Via Nazionale. The entrance is a small (2 inch) step up from the street onto a level portico deep enough for the wheelchair. There are double doors – I was just able to squeak through one open door. The reception and breakfast areas are on the same level as the entrance. There is a bar area that is one step down, and this is the route to the elevator. The hotel staff placed a stable wood ramp at that step during my stay. The elevator was minute, but usable. I was able to roll in backwards and turn sharply right with some practice. I took up the entire space in the elevator; no other person or bag could be put in there with me. Our room was #27, a triple (as the desk clerk put it, “the size of single in the United States”) with a double bed and a single bed. 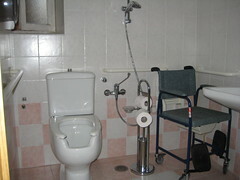 The bathroom door was too narrow for the wheelchair, but we placed a desk chair just inside the door and that enabled me to transfer from wheelchair to commode to bathtub. 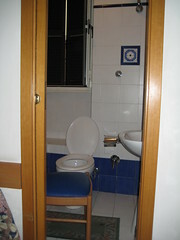 The hotel’s intent was that I use the separate outfitted bathroom in the hallway (complete with shower chair and all sorts of good stuff), but the door to that bathroom was unfortunately also too narrow for my chair, partly because the door was set against a slanted wall that made it impossible to fully open it. Ok, enough bathrooms (“thank you,” my husband says in the background). The other fun access aspect of staying at the Grifo was that the street was completely torn up for repaving when we arrived. The staff looked at us tragically when we arrived and informed us that they had been promised, promised, that everything would be done by Friday (that day). Turns out the construction had been going on since May. But no matter. The constructions guys put up all sorts of wooden pathways and ramps, pretty much just for me, although everybody who walked up the street enjoyed them. When we came back after Florence, almost all of the street was paved (although still closed to traffic) and it was much easier. Everyone was very helpful. To find a hotel in Florence, we started with the list in Cornelia Danielson’s The Accessible Guide to Florence, which was fantastically helpful and detailed. We booked at Hotel Orto de’ Medici, and were not disappointed. Room #14 was large, with a very accessible bathroom (I’ll spare you the picture, but it’s in the Flickr photostream). It faced the courtyard (quieter than a street-facing room). The elevator was large enough for the two of us snuggled close together. The breakfast room and lounge (with internet access) were on the same floor as our room and fully accessible. There is an outdoor terrace adjoining the breakfast room that has one of those high-centering lintels, so we didn’t go out there (it was a little cool in the mornings for breakfast on the terrace, anyway). The hotel entrance was level and roomy, and the sidewalk curb was dropped in front of the hotel. We stayed at Hotel Roma, which worked for one night, but I would not have wanted to stay any longer. It was cheap and clean, and the breakfast was actually very good (most of the guests seemed to be Germans, and Germans want decent bread and soft-boiled eggs at breakfast). The elevator was large enough for the two of us. The bathroom was up one large step, so this was a crawl-in affair and I didn’t try to take a shower. 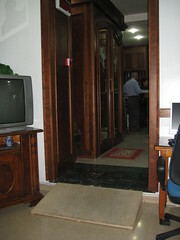 While in Rome, we visited the Hotel Lancelot, and they were kind enough to show us an accessible room. It’s a beautiful building (the neighborhood reminds me of diplomatic residences) in a cul-de-sac above the Colosseum. The room is large and accessible. Our one concern would be that in order to get anywhere from the Lancelot you have to cross the amazingly busy Via Celio Vibenna (absolutely choked with tour buses). The Grifo is in a much more walkable neighborhood. You are! You’re so supportive! Someday I’ll publish a book: Bathrooms I have Known and Loved, or maybe Bathrooms I Could Get Into. If I might add to the bathroom chatter–I don’t have the accessible issue, but there is one bathroom in Italy that is indelibly engraved in my memory. Our bus broke down outside a lake in Italy and the only available bathroom was a “Johnny on the Spot” type. You had to pay to use it, and I did. Then the door closed and I noticed a sign next to it that in 5 minutes it would re-open whether I was ready or not. My constipation problem remained unsolved, needless to say. Every time I go someplace where there is an accessible bathroom, I find myself thinking, “Use it now and use it later.” After all, it might be hours until I find another bathroom I can actually get into (without major assistance). It’s the little things . . .